At eighteen years of age it may perhaps appear that Clare was overcome by a sudden whim or emotional enthusiasm of a passing nature. But the strength of will and singleness of purpose already displayed by her in her own home when the subject of marriage was broached, and now in her resolve to give herself to the one Love of her live, never left her. No sooner was the will of God confirmed for her by Francis than she determined to act without further delay. The plan was made: she was to slip away from her home on the night of Palm Sunday 1212, when Francis would receive her as a dedicated bride of the King of Kings. Without doubt everything was known to the bishop in advance, but he also knew that fierce opposition would greet such a proposal and the secret must be kept. So Clare attended the great service in the cathedral on Palm Sunday with her family, dressed in her splendid robes; but when the time came for the people to move up to receive their Palm Branch from the hands of the Bishop, Clare was overcome and could not move from her place. Bishop Guido noticed, and with deep sympathy came down and placed a Palm in her hands. The plan worked well. In the middle of the night, when the house was silent, Clare made her way to an un-used door away from the main entrance which would have been not only locked but guarded all night due to the turbulent times. With her bare hands she succeeded in removing the barriers with which the second door was boarded up – a feat which astounded everybody later. Then she was joined by her waiting friend, Pacifica Guelfuccio, and the two made their way silently out of the city towards the tiny chapel of Saint Mary of the Angels, or Portiuncula, beloved by Saint Francis as the cradle and motherhouse of the new Order of Friars Minor. 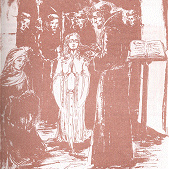 Francis and his little band of friars came to meet them with lighted torches. Before the altar, in the flickering torchlight, he cut the beautiful pale gold tresses framing her radiant face. It was her entrance day and profession day all in one. 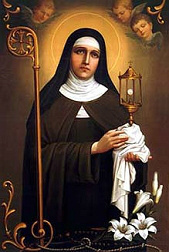 So was born the Order of Poor Enclosed Ladies – or simply the Poor Clares, as they were known after the death of their Mother and Foundress, Saint Clare. Those titles have a venerable ring surely ! We have to remind ourselves that Clare was but a mere eighteen years old – but endowed with a wisdom and prudence and solid virtue which could only be the fruit of the Spirit of God finding ready soil in her willing heart. As did St. Francis, St. Clare has continued over the centuries to inspire countless numbers of p eople, ever urging them to a simple life and a deep love of the Saviour. The Poor Clares continue to be a visible and dramatic witness to that Divine Spark that enkindled the hearts of Francis and Clare and continues to burn in the hearts of those who believe.